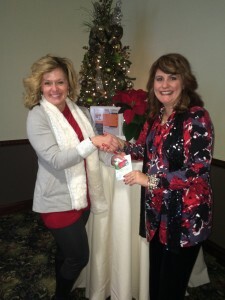 ATD Smoky Mountain Chapter Throw Down Winner Felicia Slattery Receives $100 Visa Gift Card from President Cindy Light. Moving to a new town can be a challenge. Moving to a new town after living in the same area for almost all your life can be daunting. Moving to a new town, and trying to break into the business scene where literally NO ONE knows you could lead to professional suicide. Sounds like fun! So we gave it a whirl! In July 2015, my husband and I moved our family of four, plus Sadie the Speaker Dog, away from the frigid, icy, snowy, long winters and terrible taxes in the state of Illinois, to a warmer climate all around in beautiful Knoxville, east Tennessee. I spent most of the summer getting myself and the kids settled and much of the fall getting to know the school, school moms, volunteering for this and that, and focusing on my family. Admittedly, my business was rolling along well on autopilot. But I knew it was time to get out there and meet some people. Plus, given that for me, 2016 will bring an increased focus on building the corporate training and speaking / communication consulting side of my business, I knew it was time to do what I’d been coaching my clients, webinar students, and readers to do for years: join an association where your people are hanging out. As a trainer, for me that meant checking out the local chapter Association for Talent Development (ATD – formerly ASTD, the American Society for Training and Development). Happily, there is a Knoxville chapter called the Smoky Mountain Chapter, and they have a website with info about upcoming meetings. While looking over the site, I noticed an announcement for their second annual December Trainer Throw Down speech contest. The application deadline was soon approaching. They had me at “speech contest.” I was in. The topic was engagement. I speak regularly about audience and reader engagement, so the topic was right up my alley. Having grown up in high school as a competitive speaker and then being recruited for Bradley University’s Speech Team, THE most winning collegiate team in ANYTHING in the country, I am no stranger to competing on stage. Well, at least I wasn’t 25 years ago… gulp. However, given the time limit for the Throw Down was 10 minutes, I took that as a sign I should go for it because that was our time limit when competing in college. Plus, even if I lost – remember, I’d never been to even one of their meetings to know what these people were all about – they could well have been national champ team speakers, too – but I figured after getting up there everyone would at least know who I was and get a taste of what I can do on stage, and that was my whole goal. The BEST way to meet a room full of people is always to be the speaker. Right away I knew I wanted to talk about engaging an audience using all five senses. Beyond that, I wasn’t sure what I’d do, so I let the holidays, family life, and regular business stuff occupy the front of my mind while the topic of engagement percolated in the back of my brain and I waited for inspiration. At first I was stuck staring at the cursor. Then after praying for what to do, it hit me: ‘Twas the Night Before Christmas! It was perfect because I could write a stanza about each of the 5 senses. Then I created a handout, pictured here. I used one of my speaker one-sheet templates to make that job go super fast and in a couple hours I had my original poem written, my handout done and ordered from Staples, and was in bed sleeping soundly. Here is that winning poem. One thing to keep in mind – I wrote it SPECIFICALLY for this ONE occasion and for the people in that room. If I were to deliver this again, I’d make a few alterations, but it did the job. I won! The trainers were training and throwing down with great grace. With hopes that the prize might be hers to claim. To see who would win and the glory to get. And discover how the people can learn what you want them to hear. So they can become even better, and your lessons then know. What’s a trainer to do not to break out in hives? Plan to surprise, to delight. It’s not hard, if you commit. But put on a hat, use some props, try out a fun slide, make it a show. Multimedia’s a way – and yes even today. And they’ll keep watching you and your training with glee. But how about a toy that makes a sound like [ka ching]. Let’s move on to taste while you eat this sweet cane. That engages the mind which of course is quite good, or so you’d deduce. And enjoying a treat also lightens the mood. That you teach. It makes the learning more real. Shake a hand, pat a back, give hive fives and you’ll score. Engage with a story and watch memory improve. I stayed up half the night to write what I wrote. You can see how anyone here could make learning so deep. No, we all win with engagement and telling a great story. Be sincere, be real, be yourself, tell some jokes. As I end this, I wish all contestants good luck. You amaze me, and I feel a certain awestruck. Happy training to all, and to all a good day! With each one of the stanzas related to a different sense, I used a different prop of some kind – all pictured here. I downloaded a video of a crackling fire and put that up on the screen in place of a slideshow to set the scene and incorporate sound and sight. 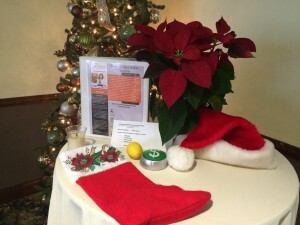 I wore a Santa hat, and dragged my prop table to be next to the Christmas tree in the front of the room, which the restaurant had so graciously placed there not even knowing I’d be able to use it! And then I enlisted help from a college student to pass out candy canes when I talked about the sense of taste. Each of the props I used I pulled from a Christmas stocking. It all went great! I won by just two points, but a win is a win! What did I win? What a relief. Want to see the presentation? Video is coming soon!